Two members of CREATe – Dr Elena Cooper (Leverhulme Fellow) and Andrea Wallace (CREATe PhD candidate and Lecturer in Law, University of Exeter) – recently presented at an interdisciplinary roundtable, to celebrate the publication of an exciting new volume later this year: A History of Intellectual Property in 50 Objects edited by Dan Hunter and Claudy Op Den Camp (CUP, forthcoming 2018). 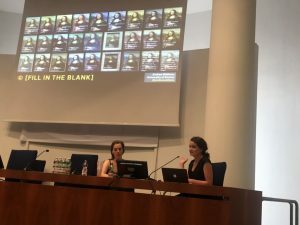 The roundtable, held at University of Roma Tre, Rome, brought together 18 presenters from a diverse range of disciplinary backgrounds, each examining an object as a means of elucidating broader themes from the history of intellectual property. Amongst the presenters were a number of contributors to the volume and these included Jane Ginsburg (Tempesta Map of Rome), Peter Jaszi (Uncle Tom’s Cabin), Peter Decherney (Mickey Mouse’s Steamboat Willie), Marianne Dahlén (the Ferragamo wedge), Michael Madison (the soccer ball) and Maurizio Borghi (the Player Piano roll). Dr Cooper, presented a nineteenth century fake of John Linnell’s Heath Scene, at issue in the criminal law case R v. Closs decided in 1857. In Closs, it was held that the imitation of an artist’s signature in the corner of a painting was not a ‘forgery’ in the eyes of the law and Dr Cooper argued that the case, with its focus on the safeguarding of the financial value of the physical art object, also illustrated a little-know facet of nineteenth century painting copyright (explored further in her forthcoming monograph Art and Modern Copyright: The Contested Image, CUP). Andrea Wallace, a contributor to the volume, examined the Mona Lisa in a presentation entitled © [Fill the Blank]. Drawing on her PhD research Surrogate IP rights in the cultural sector, she identified the numerous claims to copyright protection in depictions of Leonardo DaVinci’s famous paintings that can be found on-line. The roundtable was a pre-event to the 10th annual meeting of the International Society for the History and Theory of Intellectual Propert (ISHTIP) also hosted by University of Roma Tre. Intellectual Property – Oral Histories: Using personal recollections, artefacts and opinions of those who participated in the making of intellectual property in their professional capacities – this project augments historical understanding of intellectual property through the creation of a digital archive of open and publicly accessible material that records, preserves and transcribes oral interviews with intellectual property practitioners, lobbyists and civil servants. The editors are Jose Bellido and Lionel Bently. An update to Primary Sources on Copyright, adding British documents and commentaries illustrating distinct aspects of the history of copyright concerning the visual arts in the late nineteenth century (1869-1900). The editor for these documents is Elena Cooper. The Stationers Register Online (link active by end of July): An online, searchable database of the London Stationers’ Register (1557-1640). Prior to the copyright statute of 1710, the Register was the primary mechanism for the book trade in England to register and protect publishing rights. A registration requirement persisted from the Statute of Anne of 1710 until the Imperial Copyright Act of 1911. The editors are Giles Bergel and Ian Gadd.